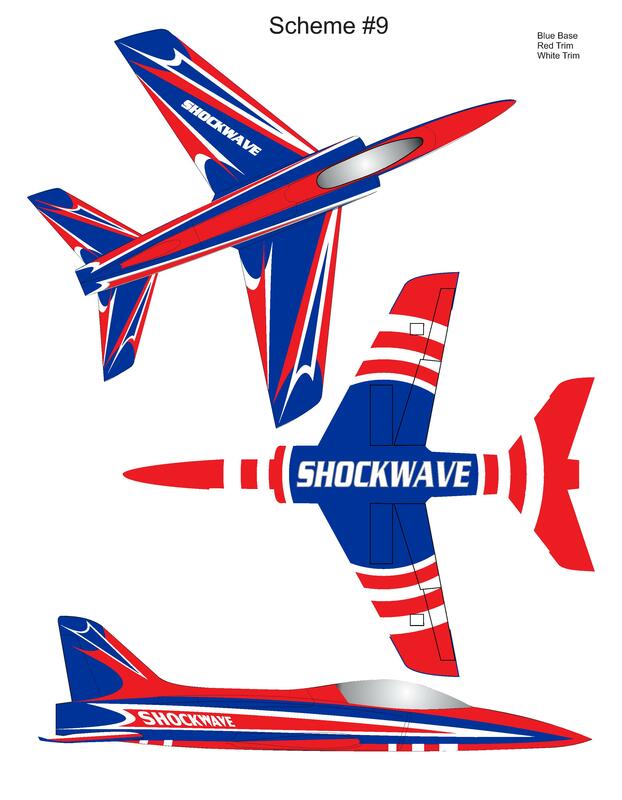 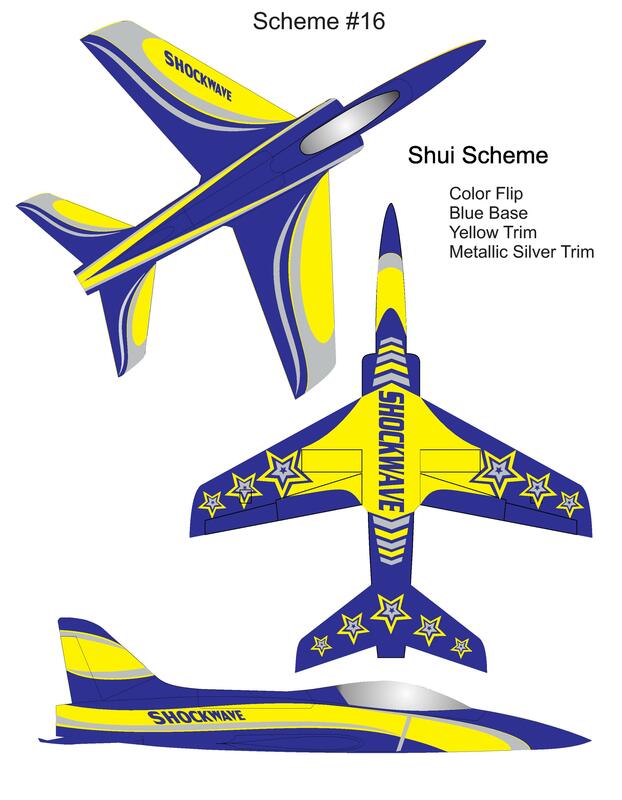 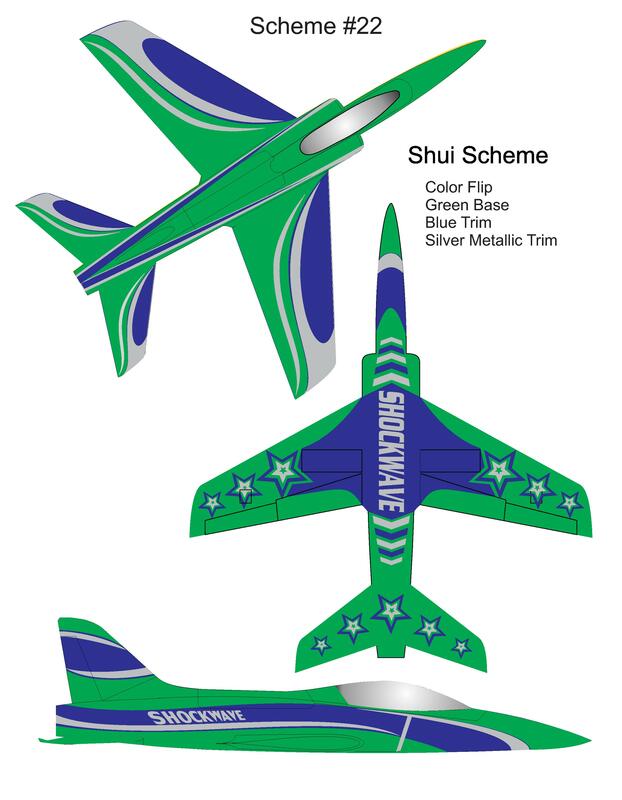 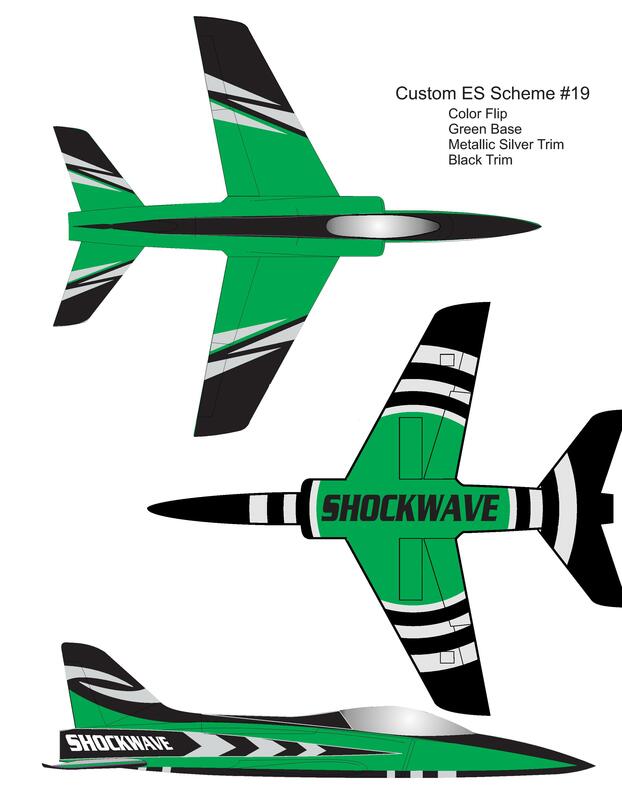 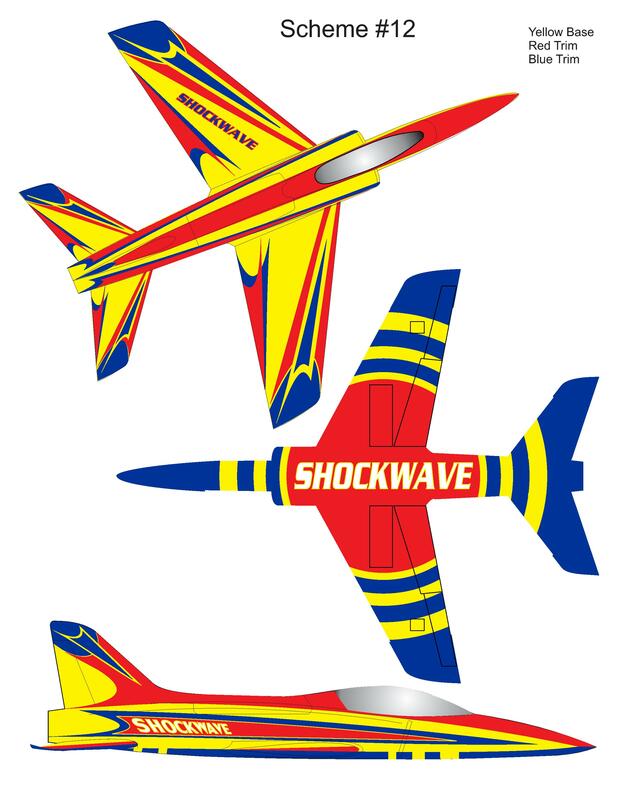 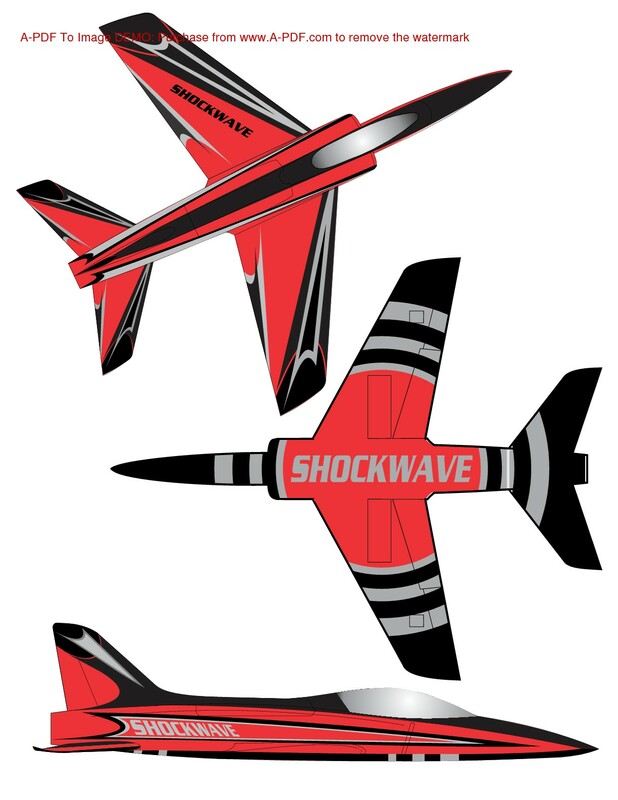 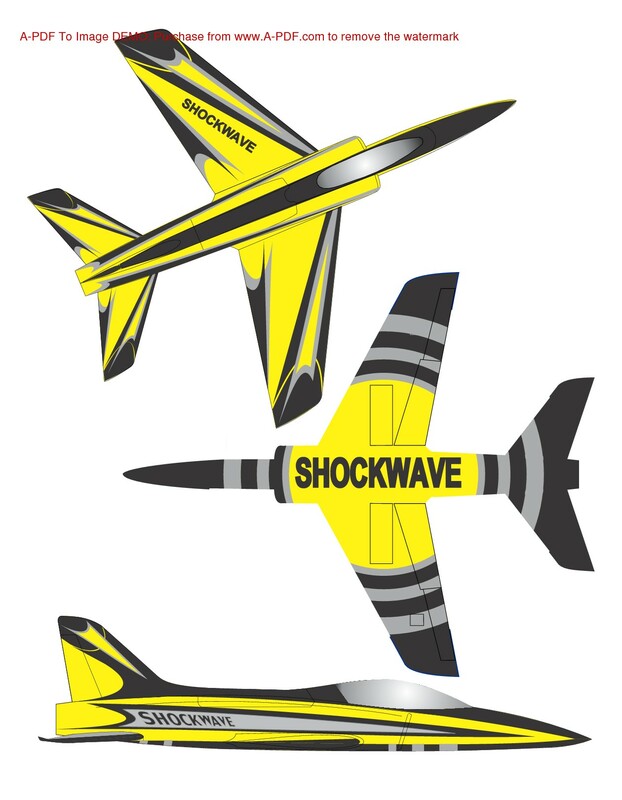 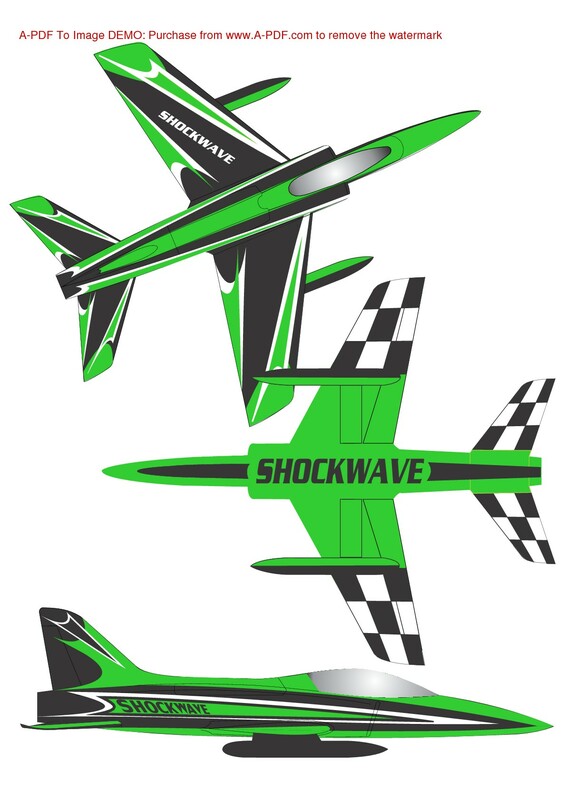 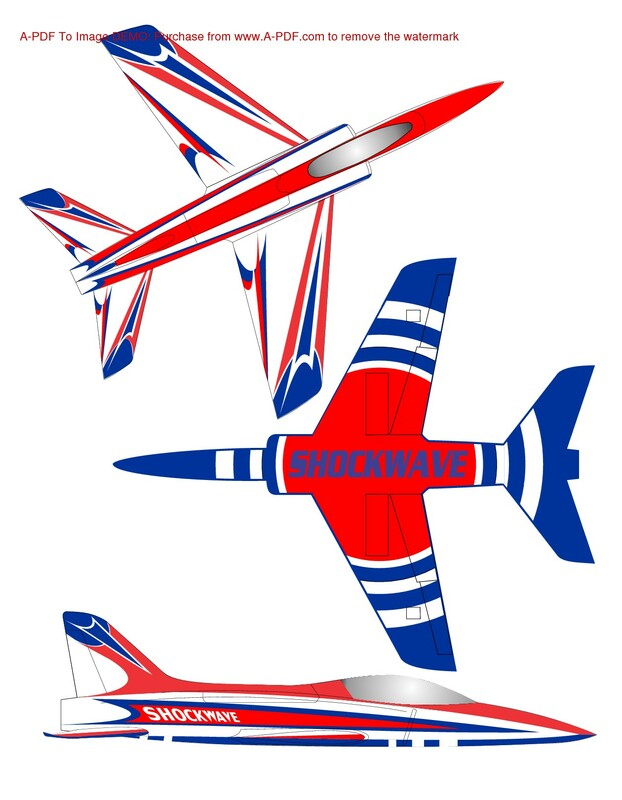 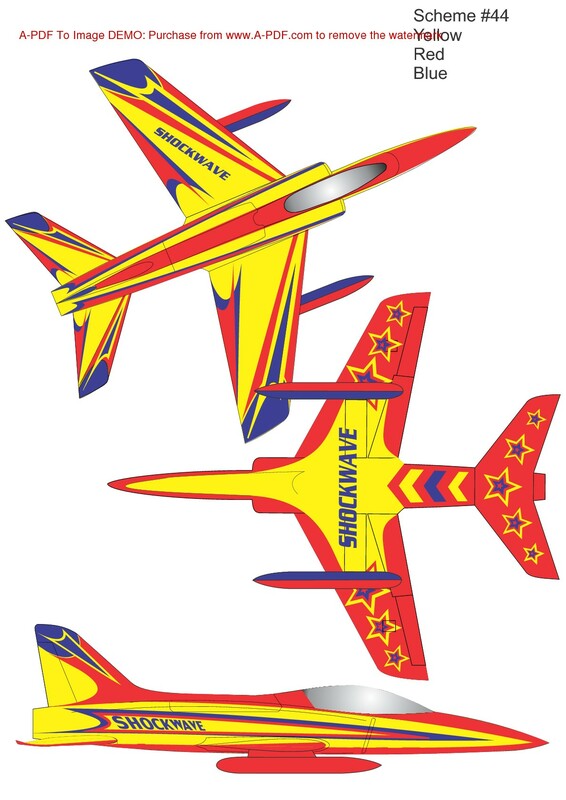 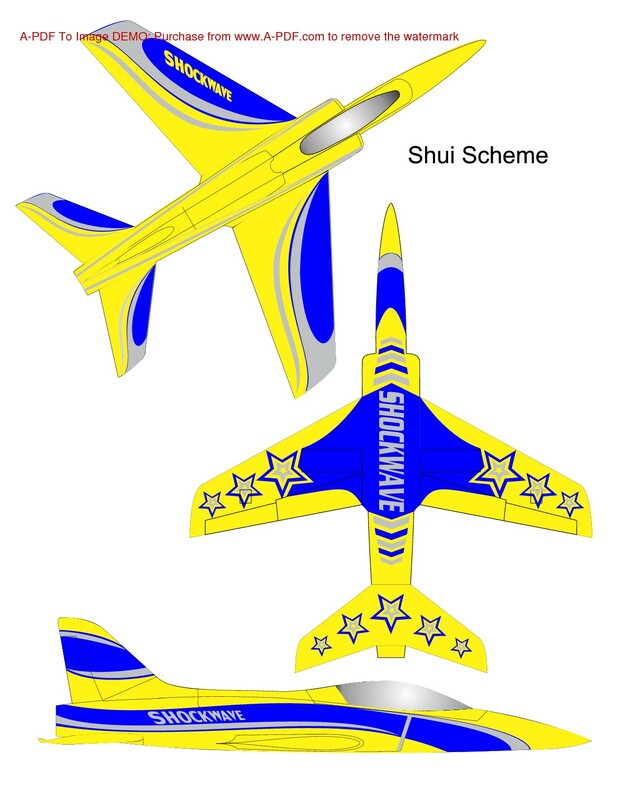 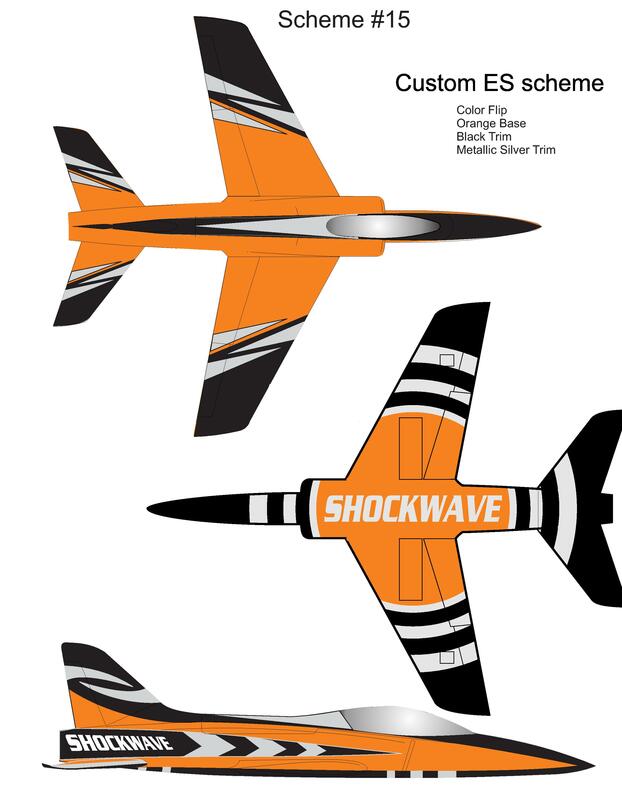 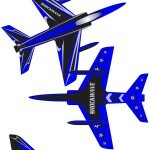 The Shockwave is an all newly designed large sport jet that features a painted-in-the-mold process and is highly prefabricated(ARF), saving the builder/pilot lots of assembly/build time. 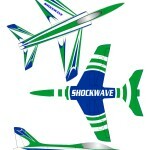 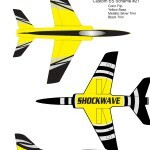 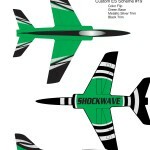 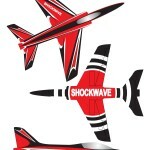 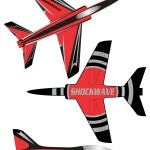 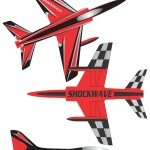 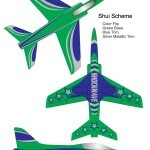 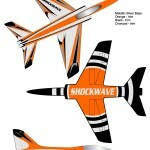 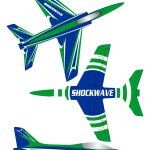 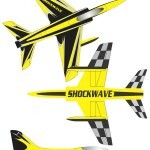 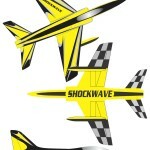 The Shockwave is available in a variety of color schemes. 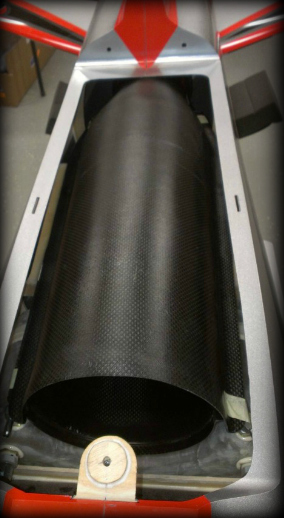 The 3 conformal Kevlar fuel tanks provide a generous 6.8 liters of fuel and 2 liters of smoke oil (1 conformal tank) to satisfy any size motor’s appetite. 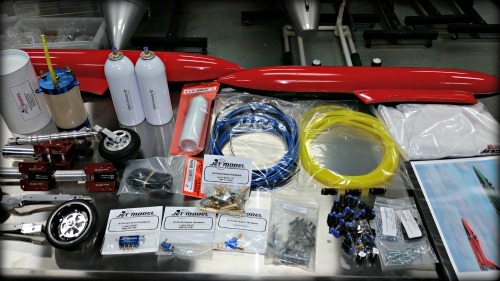 The custom oversized 3/16th fuel tank fittings that are provided may seem like overkill, but experience has taught us to go with larger diameter fittings to ensure that there are not ANY fuel delivery restrictions to the fuel pump. 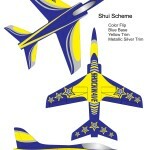 With its 90″ wingspan, and 102″ length fuselage, it is one of the largest sport jets available today. The huge flaps and generous amount of wing area provide great stability at any speed and super slow landing approaches that make it easy for even a low time turbine pilot to feel comfortable flying such a large model. 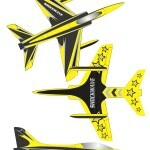 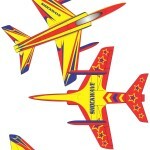 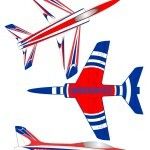 The fuselage is a one-piece design as this helps keep the overall weight down and still provides a strong model aircraft that will withstand extreme aerobatics and high G maneuvers. We have thoroughly tested the Shockwave’s flight envelope and it will far exceed that of any of the current sport jet models available to date. 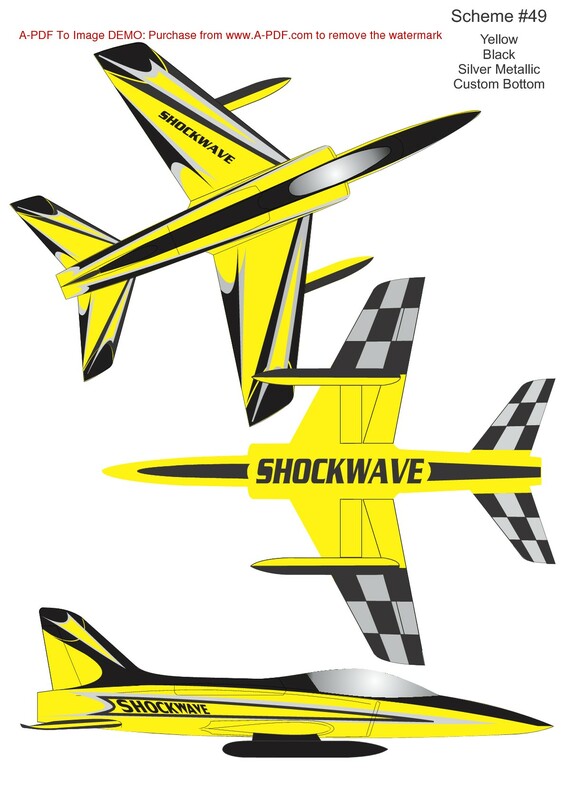 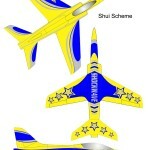 Transportation is easy thanks to a 1-piece stab which is attached to the fuselage with 2 bolts from the underside, an easily removable Vertical fin/rudder, which is removable with a single bolt, and slip on wings which ride on a custom carbon fiber double-wall tube that have been tested above 2,000 Lbs of force without failure or fatigue. 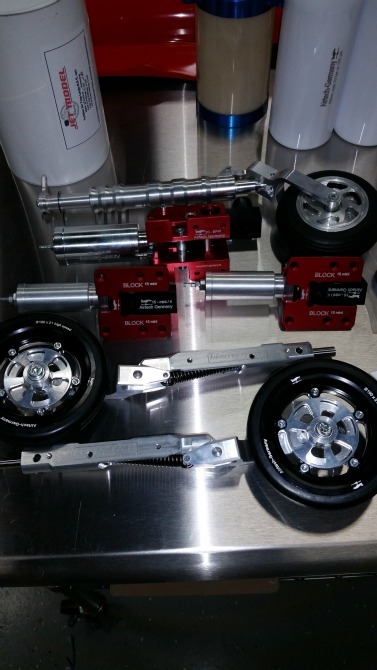 The complete trailing link landing gear is CNC precision machined and features a large 3-5/8″ diameter nose wheel and 4″ main wheels that let the Shockwave fly off of the roughest field conditions. 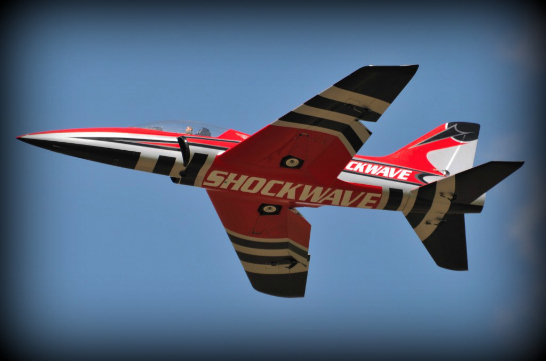 Our trailing link landing gear features heavy duty springs, to keep the Shockwave from launching into the air prematurely on take-off due to rough field conditions and helps keep your landings smooth by helping to eliminate the dreaded “bounce” upon touchdown. When you power the Shockwave with a 160N-180N sized turbine, the short field capabilities is superb due to the low wing loading and high lift combination (39lbs finished weight). 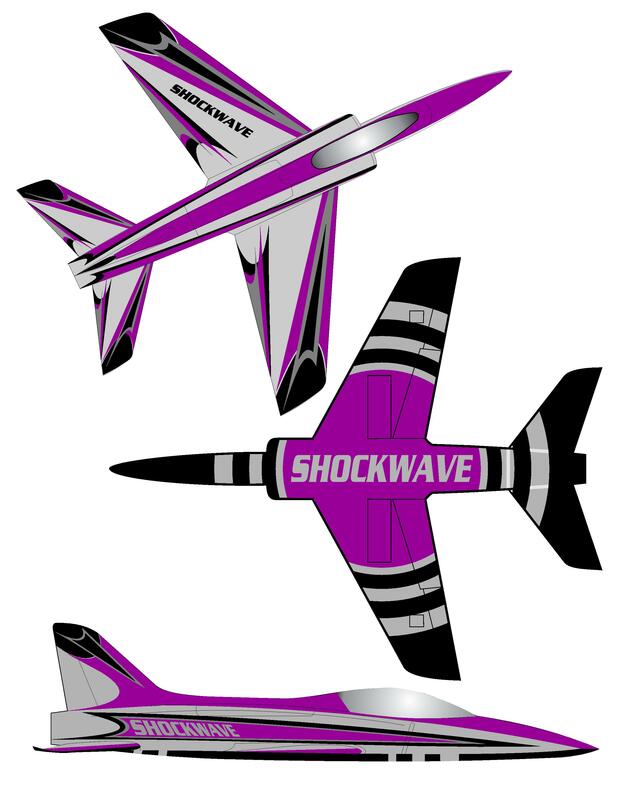 We have flown many flights with different turbine combinations ranging from 36lbs to 50lbs of thrust and based on our flight testing the 36-42lb range is the ideal combination for your Shockwave.